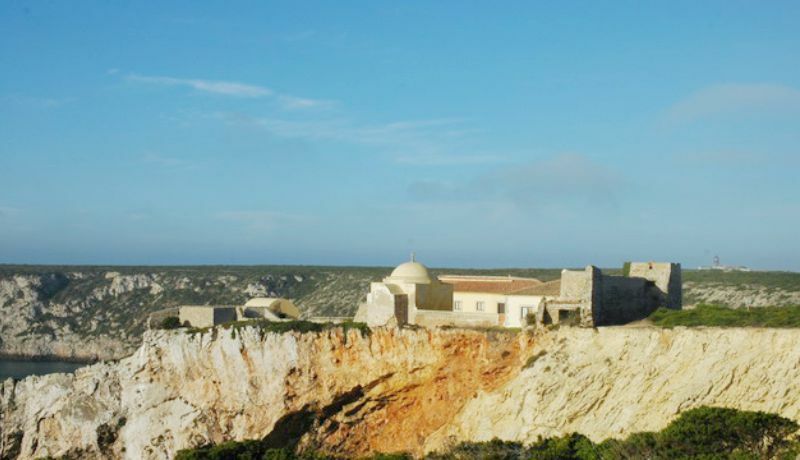 Sagres's history can be defined by its geographical location and the stunning landscape of the promontories of Sagres and Cape St. Vincent. Here we can find the historical remains of Portuguese expansionist policy in the 15th and 16th centuries. The Sagres Promontory is in a great strategic position since it has two coves that constitute excellent anchorages and landing points, also being an excellent point of observation and control of the coastal navigation between the Mediterranean and the Atlantic. On the other hand, the piece of land that extends on sea constitutes itself a position of natural defense due to the high cliffs that surrounds it, being sufficient for that a small fortification by the side of earth to make the place virtually impregnable. Returning to the year 1443, on October 27, prince Henry receives from his brother, the regent D. Pedro, a letter of donation from the Trasfalmenar cape and a legua of term (Sagres and its surrounding region). Indeed, the Infante, having been aware, probably since 1415, of the contingencies to navigation provoked by the strong prevailing winds in the region of Sagres, soon realized the necessity that the boats that folded the corporal felt in staying sheltered in the bays of cape of Sagres This stay could drag on for long periods, while waiting for see and winds favorable to navigation. In this way, the Infant defended the need to provide some support to these navigators who, during their wait, were deprived of food and religious assistance. On the other hand, he considered the strategic importance of this region, since it was a practically obligatory point of reference for commercial vessels, connecting the Mediterranean and the North Atlantic, beyond its proximity to North Africa and the advantages that could result therefrom for the Portuguese expansionist project in that region which had begun with the conquest of Ceuta. 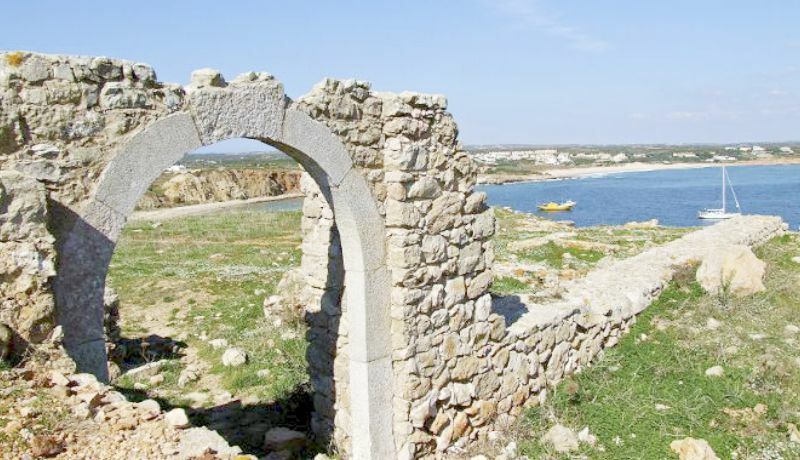 This explains the interest of the Infante in the region of Sagres, as well as his initiative to establish there a fortified village to support and defend navigation, which he named “Vila do Infante”. This Henrique's fortification is most likely to be found in the drawing dated 1587, the author of which was an expedition accompanying of English corsair, Sir Francis Drake, during his devastating incursion into the region of Sagres and St. Vincent. Although more than a century after the death of the Infante, it is very probable that the fortress represented here is of Henrique foundation, because, from the available documentation, no changes were made to the original fortification during this period, with except for two bastions that were attached to the wall in 1573 by order of D. Sebastião. It was then a wall with medieval characteristics but already with some innovations destined to the combat with firearms, what is characterized like a fortification of transition between the medieval military architecture and the modern military architecture. Indeed, the development of artillery and the full use of firearms in war scenarios marks the beginning of a new era in military strategy and architecture. The introduction of the bulwark as an essential element of any fortification is the response, in the defensive field, to the developments of the offensive techniques, reason why the military architecture enters definitively in the Modern period, appearing the first fortresses and batteries "abaluartadas". The bastions were then structures, initially of circular form and, later of angular forms, that stood out in the walls. Designed to use modern artillery, they were strategically placed to allow cross-firing of their artillery, increasing their effectiveness and allowing considerable firepower. In 1573, by order of D. Sebastião, the first bastions appeared in the Fortress of Sagres. Arranged at the ends of Henry's wall, they shielded the front door through the crossfire between them. Later, during the reign of Philip I of Portugal (1581-1598), the monarch built a tower over the barbican of Henanque, under which the entrance of the fortress was processed by a tunnel that connected the entrance door to the interior of the fortress casing. . At the top of this tower, or Central Tower, was a platform properly prepared for the placement of fireworks, increasing the defensive power of the Sagres's Fortress. However, the wall layout remained unchanged and, despite these changes, still remained a fortification of transition. In 1621, the Neapolitan engineer, Alexandre Massai, proposes the construction of new bastions for the Sagres's Fortress, presenting two possible moths. These were two larger and wider bastions and could house a greater number of hydrants. But it was only after the restoration (1640), in the reign of king João IV, that work began on the construction of a new road to the wall and walls of the Sagres's Fortress . Although it coexists with the wall of Henry, the new fortification already presents/displays the characteristics and the configuration of a modern fortress “abaluartada”. Its construction remains incomplete for a long period of time, in addition to having suffered serious damages with the great earthquake of 1755. Thus, only in the end of century XVIII, in 1793/94, the Sagres's Fortress was completed with a new layout and configuration. The primitive wall of Henry was finally demolished, giving place to a modern maritime fortress designed and constructed for firearms. As the previous fortification, in addition to incomplete, was in an advanced state of ruin, it was necessary to build a new defensive system, whose design was based on the method of fortification of marshal Vauban. As we shall see later, this consisted of the perfect application of a complex system of angles and measurements in the bastions, so that its position in the curtain or wall allowed the crossfire of its batteries to obtain the greatest effectiveness, canceling the blind angles in the sectors of footage. On the other hand, the implementation of a defensive system must obey the characteristics of the terrain that surrounds it. Thus, in 1794, the Sagres's Fortress was finally completed, presenting all the characteristics of the modern system “abaluartado”, totally thought for the use and combat with firearms. In fact, the tall towers and the medieval walls, built of massive blocks of carved stone, gave way to smaller, thicker defensive structures made of mortar and plaster, designed and built to better absorb the impact of enemy projectiles, while their artillery, just above the level of the terrain, presented an impressive fire power, crossed and grazing, on the enemy. But the differences of the medieval period are not limited to military architecture. The development and current use of firearms on the battlefield has forced a reorganization of military strategy, particularly in the defensive field. While in the Medieval Period the fortifications - castles - were intended mainly for the defense of the populations that inhabited its interior or nearby, in the modern period, the strong fortifications - had as main objective to guarantee the defense of a more comprehensive area and not only of a particular place , or locality, in a narrow sense. In this way, the implantation of a fortress followed a complex defense plan, in which, through the communication and interaction of several fortifications, the so-called "defensive line" resulted. And the Fortress of Sagres is precisely the coordinating center of a defensive line, which extends to the western end of the Algarve coast. In this sense, more than a Fortress, we are facing a War Plaza, on which the forts of Baleeira, Beliche, São Vicente, Carrapateira and Arrifana depend directly. On the other hand, the Fortress of Sagres is included in the category of maritime fortress. But it location is not near the coastline that gives it the character of Maritime Fortification, but its purpose, that is, a whole strategy focused on the defense of the coastline and navigation control. Due to an essentially strategic ground deployment, it has smaller dimensions compared to land fortifications, since its function consisted in defending specific firing ranges, in this case, Sagres coves (Mareta, Tonel and Beliche) in isolation or in conjunction of fires with other dependent fortifications. In short, and despite the objectives of this fortification have been maintained over time, Fortaleza and Praça de Sagres has seen quite significant changes in its defensive structure, trying to keep up with technical developments in the field of military strategy. Sagres Fortress "Sagres Promontory" belongs to the Sagres War Memorial of the Kingdom of the Algarve Nowadays the promontory of Sagres presents itself as a historical symbol of national expansionist policy, of discoveries and a legacy of portuguese maritime navigation study. It is open to the public for visits and sharing a legacy of a historical era of the Portuguese nautical discoveries. According to legend, the Cape owes its name to Martyr St. Vincent, who died in Valencia (Spain) in 304 AD at the hands of the local Roman governor Dacianus because he refused to renounce his Christian faith. Dacian ordered that the body of the Saint be thrown into a field and be devoured by beasts. But the body was not profaned, because of the great and mysterious crow that appeared to defend it. Then the governor commanded that the body be cast into the sea, bound to a millstone. However, when it touched the rope that contained the grinding wheel, the body of St. Vincent was dragged by the sea, yielding to the coast in the eighth century in the region of the cape, accompanied by crows. The sacred relics will have been kept in the Corvo Church, mentioned by Edrisi in the century. XII, which was part of a small monastery (already existing there), of Mozarabic monks. This same author reports that in front of the convent was erected a small mosque where the Muslims went on pilgrimage. It is said that the crows guard the grave until the body is transferred to the Cathedral of Lisbon in 1147, after the conquest of the city to the Muslims. It is for this reason that St. Vincent became the patron saint of Lisbon and the crows are part of the city's coat of arms. At the origin was the Convent of the Corvo of the Franciscan monks, founded by D. Dinis, presumably in the place where the Church of the Crow was. The fortress was erected in 1508 by order of the Bishop of Silves, undergoing a major remodeling campaign in the early seventeenth century. A rudimentary lighthouse had existed on the cover since 1520, in a special tower built on the site of the convent, originally illuminated by an oil lamp composed of two flashes that rotated every two seconds and a range of 6 nautical miles (11 km; 6.9 mi). Between 1521 and 1557, a tower was built by King John III to defend the coast from the attacks of looters. However, in 1587, the tower was destroyed by the English privateer Francis Drake, and only returned to operation in 1606, after its restoration by the order of King Philip II. In 1835 D. Maria II ordered its reconstruction and after some improvements in 1846 was inaugurated by D. Fernando what we can consider the present lighthouse. 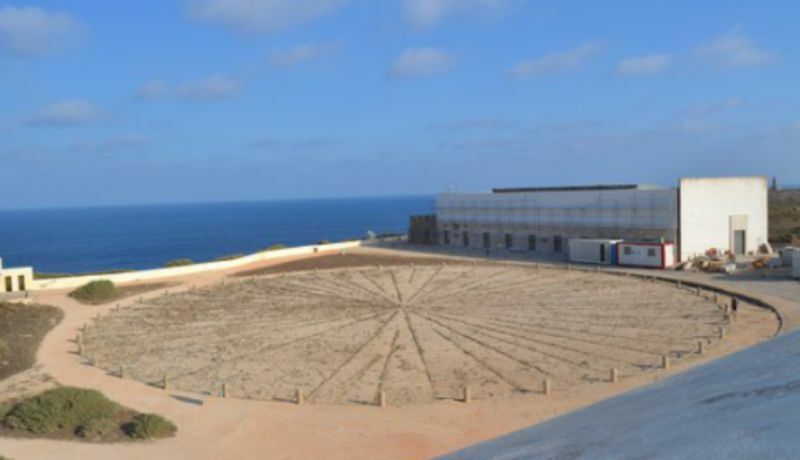 After a long period of abandonment, in 1904, the structures that remained standing were reconverted into a naval station ( Cape St. Vincent belongs to the Sagres War Memorial of the Kingdom of the Algarve ). Subject to several improvements, improvements and updates, today is a modern light. 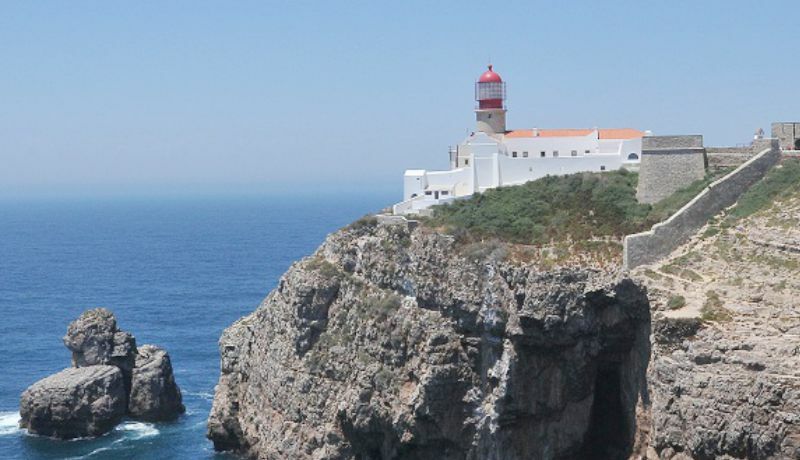 The lighthouse located at the tip of Cape San Vicente, located 7 km from the western edge of the parish of Sagres, helps the maritime navigation of one of the busiest routes in the world. Traditionally it is said that where the land ends and the sea begins, the extreme southwest of the European continent, has always been a mandatory place of passage for sailors returning from Africa and the Americas. Its position at the end of the earth attracts thousands of visitors annually, and the Portuguese navy built a visitor center and a museum on the site. The lighthouse and the museum are open to the public on Wednesday afternoons. Son of John I and of D. Filipa de Lencastre, Henry the Navigator was born in the city of Porto in 1394. 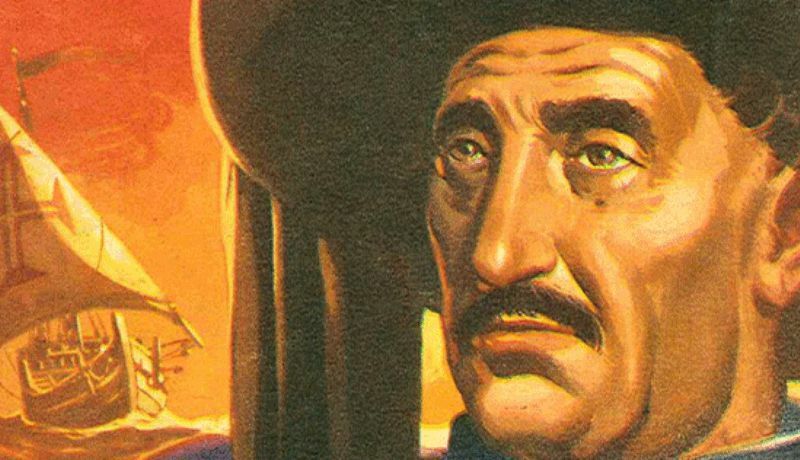 With his brothers he formed one of the most enlightened offspring of Portuguese history, celebrated in romantic literature with the epithet of Incantation Generation (ínclita Geração). The aura which he enjoyed until the nineteenth century as the principal workman of the decisive impulse given to the Atlantic navigations, and that it had around the question of its actual effigy, supposedly included in the Panels of Saint Vincent, one of its culminating points, has come however to be reevaluated. The first great feat of the infant was the participation in the conquest of Ceuta, in 1415, where it was armed knight. Made Duke of Viseu at that same year, the house of D. Henrique became, in a few years, one of the most significant of its time, consolidated, in 1418, with the administration of the Order of Christ. It was an undeniable favorable economic situation that led led the infant to organize first a Corsican fleet, and later the exploration of the Atlantic. On fact, ships at his service first arrived at Madeira (1419), the Azores (1427) and to the North African coasts, in 1434, the Cape Bojador, and thus defeating the ancestral fears related to those far distances. After a short period of interregnum, marked by the disastrous expedition to Tangier, where his brother, the infant D. Fernando, lost his life, the voyages of exploration resumed their initial rhythm in 1441,reaching Guinea and the archipelago of Cape Verde. Encouraged certainly by a militant and willing spirit of mission, prince Henry also sought the widening of his revenues and new markets, a strategy that so pleased the small landed nobility as the emerging bourgeoisie. His scientific interests, which were much discussed, were not merely instrumental, having even sponsored the introduction of an astronomy chair at the University of Lisbon and a variety of cartographic production in support of navigations, although not with the systematic spirit attributed to it by tradition. The infant D. Henrique, in 1416 or 1419,founded a village on promontory of Sagres (the village became known as Vila do Infante, and is currently named Sagres), where it went to live; began to face the waves of the Atlantic Ocean, and to think about how to start their discovering expeditions. He called a famous cosmographer from abroad, Jaime de Maiorga, and aided by him, he devoted himself earnestly to the study. Henrique established in the new village a school of cosmography and navigation which was frequented by the knights of his house, and by other men who were enthusiastic about their enterprises. Although the studies of the infant of Jaime de Maiorga and of other celebrated men grouping around the son of Dom Joao I were not in the regular form of a course, yet the conversation of the infant, Jaime de Maiorga, and other celebrated men who gathered around the son of King John I, would be highly instructive for the knights who listened to them, and they were the ones who later guided King Henry's caravels in their undertakings. In the village, the infant also established shipbuilding yards and workshops, and erected the first astronomical observatory that existed in Portugal. Within the village there was a chapel dedicated to N. Sr.ª da Conceição, and a cemetery outside the church of Santa Catarina, above the port where those who came in the ships disembarked, so that the dizzying ones that died there, were buried. Implanted in the top of the cliff that dominates the bay of the Beliche (or Belixe), the time of construction of this fortress is unknown, being certain that already existed in century XVI, because in it exists a shield of the king D. Sebastião. Because of the strategic position it occupies in one of the capes that controls the southern and western coasts of the country, it has been assumed that the site has been used since ancient times for military purposes, although there has not yet been any monographic study to clarify or discuss, the origins of this fortress. The possibility of having been built by order of D. Manuel, who went to Cabo de São Vicente at the turn of the sixteenth century, is an attractive proposition, but remains, for the time being, as a mere hypothesis. In the second half of the sixteenth century, in 1578, the English privateer Francis Drake attacked it and caused serious damage. The extent of the damage inflicted is not known, but it is presumed that they were important enough to motivate the reconstruction of the whole. This occurred only in full Philippine dominion and at a time when the Iberian government paid particular attention to the defense of the Southwest coast, constantly attacked by corsairs and pirates to pay the kingdoms of Northern Europe. The entrance door of the fortress shows the date of 1632, which must correspond to the year of completion of the work, and then the second governor of the province, D. Luís de Sousa. The fortress follows a structure common to the military architecture of the time, with a star-shaped polygonal plan, strategically with batteries facing the sea. The main door, with a perfect back arc, is located in the west, in a recess formed by a buttress of a tower. In the interior, there is a second curtain, which protects a long staircase that gives access to the beach and where the supplies and other materials would enter in case of a land fence. The entrance to the fortress itself is made through a perfect back arc on this inner fortified line and is dominated by a quadrangular tower, accessed through a walkway. The military garrison support facilities (covered wardrobes, storerooms and common compartments) adjoin the wall, allowing the existence of a relatively large space for military maneuvers. Inside the is the chapel of Santa Catarina (currently dedicated to Santo António), a small temple with a centralized plan, consisting of a quadrangular nave covered by a cupola and a small chancel. The present fortification goes back to a reconstruction by determination of Filipe III of Portugal (1621-1640), having been reopened in 1632 according to epigraphic inscription on the gate of arms. However the earthquake of 1755 caused great damage to him and was progressively abandoned. It was finally recovered in 1960, whose work was carried out by the National Directorate of Buildings and Monuments, in view of the commemorations of the V Centenary of the Death of Infante D. Henrique. Fort Beliche belongs to the War Kingdom of the Algarve . They are monoliths carved in white limestone, whose monumentality evokes the vital forces and the cycle of renewal that orders space in physical and mental terms, directly linked to the sacred and the observation of the stars. In the county of Vila do Bispo, numerous menhirs have been found, some of them decorated in relief, which some authors associate with the rituals described by Strabo, which refers to the existence of " stones organized in groups of three or four, which, according to an ancient custom , are turned upside down by those who visit the place and after offering a libation are replaced in their former position . 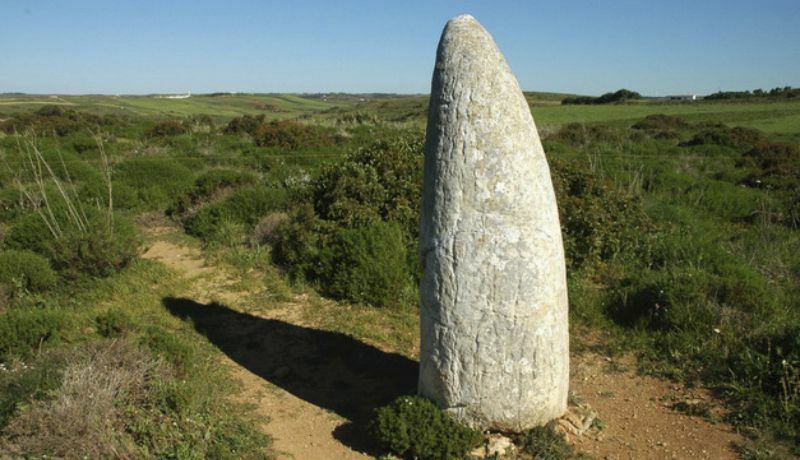 The first references to the menhirs of Vila do Bispo were made by Estacio da Veiga in the work (munumentaes antiquities of the Algarve), commented the author of these munumentaes stones that there are many in situ throughout the kingdom but no one has dealt with inventories, the ". Finally, the city council decided that it was time for these roots to be put to the top. Since our region was a great crossroads of historical mysteries, where pagan rites such as those of Catholicity and Munsulman were mixed, and a realm of the interests of an expansion that was in sight, one could not stay longer without further study. deep of the vestiges of our roots, unknown to the majority of our population, and shows them. Since there are more than 40 menhirs cataloged and possibly there are still more, so it is easier to find them. If you want to venture out on Mount Amante and go visit the menhirs, just follow the map below that it will not be difficult to find the old dens of pagan rituals dating back more than 5,000 years before Christ. Although a little damaged by the years and by the action of the religions of the time, for the removal of the pagan rituals, and the ignorance of the populations that would use them. It is recommended, therefore, that it be preserved, and if by luck, will discover new vestiges that are informed to the authorities, for their consequent classification. In the place already are available some brochures allusive to this zone, to easily locate the menhirs. And we have already begun with some ruffians that we hope will not take too long to conclude. The walk is done in totality on foot has a distance of 1200 meters. 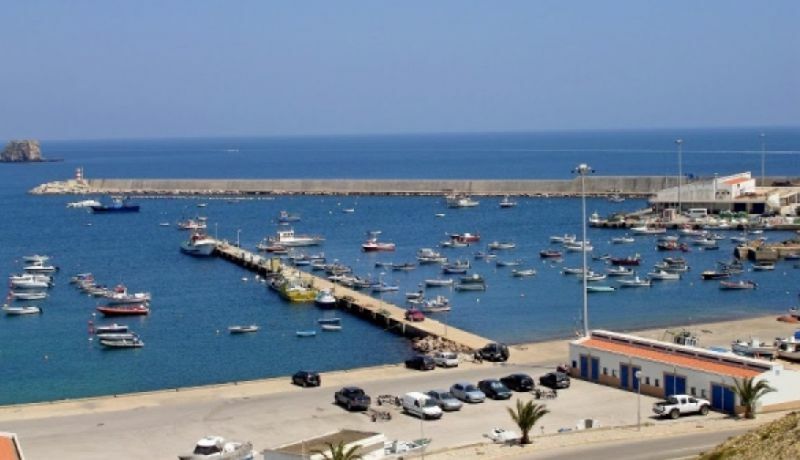 Baleeira harbour is in the surrounding scenery of small fishing boats, which make this activity one of the main pillars of the local economy and the beautiful small island of the martinhal, also has a small beach.